Experience the Light and Sound of God! Click here to find out more about the 2019 Shining Your Light as Soul Springtime Seminar. Watch a powerful 5 minute video to discover the joy and wonder of Soul at Eckankar's official youtube channel: ECKANKAR: The Reality of Spiritual Experiences. Are you seeking answers to help you figure out how to overcome difficulties or worries in life? Click the link for the free booklet that may give you insights titled ECK Wisdom on Solving Problems. Would you like to learn more about Eckankar, the Path of Spiritual Freedom? Check out the Spiritual Wisdom Journal newsletter—a free online resource for the spiritual seeker. ECKANKAR, the Path of Spiritual Freedom, is ancient wisdom for today. Its teachings emphasize the value of personal experiences as the most natural way back to God. Whatever your religious background, the spiritual exercises show how to look and listen within yourself to expand your consciousness and enjoy a feeling of spiritual connectedness. See for yourself—perhaps for the first time—how to live a happy, balanced, productive life and put daily concerns into loving perspective. ECKANKAR has a few basic beliefs. Simple spiritual exercises are taught that lead to the experience of the Light and Sound of God. As we practice the spiritual exercises we learn to recognize the presence of the Holy Spirit in our lives. We learn that each of us is Soul, a spark of God sent to this world to gain spiritual experience. We study dreams as a source of Inner Truth and discover how working with our dreams from a spiritual perspective helps us learn to handle daily challenges. The Spiritual Leader of ECKANKAR is Harold Klemp, the Mahanta, the Living ECK Master, who is given great respect but is not worshipped. You've always known there is something more. Are you ready to find out what? 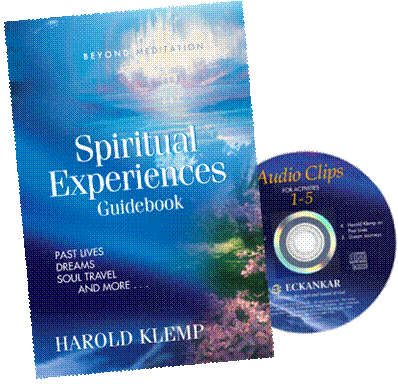 If so, send for your free Spiritual Experiences Guidebook and CD written by Harold Klemp, who is known as "the pioneer of everyday spirituality." Have You Heard the Call of Soul? Call 1-888-LOVE GOD for your free information packet today! a love song to God! Links to ECKANKAR around the World. Presented by the Alaska Satsang Society, Inc., A Chartered Affiliate of ECKANKAR. The opinions expressed in this site are those of the writers and not necessarily those of ECKANKAR or the Mahanta, the Living ECK Master, Sri Harold Klemp. Copyright © 2000-2019 ECKANKAR. All rights reserved. This copyright notice applies to this home page and all other pages of this web site. The terms ECKANKAR, ECK, EK, MAHANTA, SOUL TRAVEL, and VAIRAGI, among others, are trademarks of ECKANKAR, P.O. Box 2000, Chanhassen, MN 55317-2000 U.S.A.